Camel is an important part of the desert eco-system; in fact this Ship of the Desert is critical to survival in the rural areas. Camel is a key component of the economic activity in the desert, since it is pressed into farming and transportation. Camel is used even in maintaining law and order and has played a supportive role in several battles. The famous Ganga-Risala of the erstwhile Bikaner State participated in World War I and II as a member of the Imperial Service Troupe. Due to the importance of the camel, Project Directorate on Camel at Bikaner was established by the Government of India. Considered to be among the best such institutes across the globe and certainly the only one of its kind in Asia, it is also a major tourist destination. 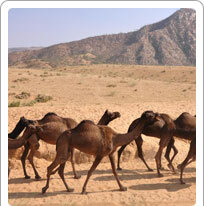 Situated a mere 8 km from Bikaner, the Camel Research Institute as it is popularly known is spread over 2000 acres. Different breeds of camel and their behaviour can be studied here. There is a camel museum and facilities for camel riding, camel safari and photography. A Camel milk parlour vending unique camel milk products like ice-cream, hot and cold beverages is the star attraction! The camel research institute is open on all days from 2.30 pm to 6.30 pm for tourists.